In Cuba’s history, ecology, and economics, interaction of water with vegetation is important and complex, e.g., “A la cintura cruzamos el río y recruzamos por él—bayás altos a la orilla…” (José Martí in Diario de Campaña de Cabo Haitiano a Dos Ríos, entry of April 14, 1895, cited in Anonymous, 2004); and “Combate en el Camino de el Tibisí (February 8, 1878), donde el teniente coronel español Hermógenes González pierde la vida a consecuencia de las heridas recibidas en la batalla. José (Maceo) hace que se le trate con todos los honores” (cited in Padrón Valdés, 1973, p. 51). Interrelationships between water, plants and climate increase in importance as conditions change and hurricanes become more frequent and intense (Knutson and Robert, 2004). Without vegetation the conditions in Cuba would be simple and horrible: just massive infrequent floods and searing droughts, for man-made change has done much harm. This menace grows closer (e.g., Díaz-Briquets and Pérez-López, 1993; Wotzkow, 1998; Daley, 2002, 2004; Murray, 2004). Informal reports from the island bring news (Barreiro, 2005); and grudging confirmation can be found in officially sanctioned Cuban reports (e.g., Riera, 2003; Grogg, 2005): “Ministry of Agriculture studies indicate 12 percent of all agricultural land in Cuba is desertified to some degree, a proportion that will rise to 15 percent by 2015.” This circumstance is progressing towards drastic climate change. One can readily imagine, what will happen when this climate change becomes extreme. Prolonged drought in eastern Cuba despite early 2005 hurricanes (Anonymous, 2005b) is now followed by flood (Pravda, 2005). In ultimate simplification, this is all a matter of attenuation of climatic extremes by vegetation’s process of evapo-transpiration (Vijayan, 2004). Here we will call the process of climate moderation through plant evapo-transpiration the Jigüe phenomenon. Cuba, like the other islands and mainland coasts of the Caribbean and the east coast of Brazil, was the domain of the Arawak; the Taíno or even the Siboney of Cuba are often classified as Island Arawak. The Arawak culture, with its descriptive language, ethic of assimilation, and rich mythology, has smoothly incorporated into modern cultures (e.g., Aikhenvald, 2004; Drummond, 1981; Heckenberger, et al., 2003; Hill and Santos-Granero, 2002; Olsen, 1974; Rivas, 2000; Rodrigues, 1986; Rouse, 1992; Wilson, 1999; Wilson and Levinsohn, 1992). In Taíno mythology, the Jigüe is a small dark man with long hair who lives by the edge of rivers and lagoons (Zayas, 1914). There he awaits, ready to seduce unwary or adventurous young Taína women with his wiles and physical endowment. The Jigüe is also known in probably transposed form as the Güije (e.g., Suárez, 1921) in Cuba. On the South American mainland, in Loko Arawak (more precisely Lokono Arawak; or Lokono Dion personal communication Alexandra Aikhenvald, 2005) he is known as Wijili (Bennett, 1989; Bennett, 1995). In a part of the Brazil jungles, once a center of civilization (Heckenberger, et al. 2003), the Jakuí, a similar mythological being is the most important spirit for the tribes of the Alto-Xingu (Villas Boas and Villas Boas, 1970). The Jakuí, equally as sexual as its counterparts, lives at the bottom of rivers and lagoons (Villas Boas and Villas Boas, 1970). The variant Güije can also be a modern day name, in one case a Castro guerrilla (Matos, 2002). In Cuba, a number of places, some in the Sierra Maestra, bear the name Jigüe. One such place was the site of an important military action in the war against Batista (e.g., Bonachea and San Martín, 1974; Matos, 2002; Dorsal, 2003; Daley, in preparation). Later on such places became scenes of resistance to Castro. Others are El Jigüe at the edges of the upper Bayamo River, and a stream near Holguín. Thus, one can argue plausibly that the Jigüe could have once been real in Cuba, where human fossil crania show heterogeneous traits which provide putative evidence of precontact multiple populations (Ross, 2004). Far stronger evidence is found in Brazil, where remains of the human being now known as Luzia may have been one such. Luzia’s age, carbon-14 dated at about 11,500 years (e.g., Dewar, 2001), is within the very sensual indigenous mythic memories (e.g., Reichel- Dolmatoff, 1971) of the last “ice age” floods. Luzia was relatively small, and her skull is interpreted as African (e.g., Dewar, 2001; Neves, et al. 1999; Neves and Atui, 2004). Luzia, it is believed, already resided in this continent at the estimated time of arrival of “the” or one of the Asian migrations that gave rise to present day Native Americans. Thus, it does not seem excessive to speculate that encounters between the then newly-arrived Asian populations with the Luzia’s relatives, could have left legendary memories of such small dark humans. Such encounters might have given rise to the myths of the Jigüe, Güije, Wijili, Jakuí, etc. It is noted that remains of such or similar small and recent humanoids have been found on the south Asian island of Flores (e.g., Diamond, 2004; Falk, et al., 2005; Wong, 2005). Of course this is speculation—yet ancient Troy was once regarded as mere legend. In Cuba rural believers, say the Jigüe makes his presence known by the chill felt at midday, as one approaches a river through a riverine gallery forest (Daley 2002). Educated people recognize the phenomena as a result of evaporation of water transpired by plants as well as river water. Transpiration, necessary for inorganic transport and photosynthesis, recovers from the ground and reemits to the air considerable amounts of water vapor (e.g., Tesar, et al., 1992; Grace and Malhi, 1999). Thus, while the Jigüe myth is probably related to events almost beyond times of human memory, the Jigüe phenomenon is real and affects all that happens in Cuba. This phenomenon results from “change of state” energetics as liquid water loses its order in transition to gaseous form (e.g., Eisenberberg and Crothers, 1979). In this process, large amounts of heat are used to evaporate water to its gaseous form and thus overcome intermolecular interactions that had stabilized the liquid form. Thus, as the day approaches and passes noon, air temperatures in the gallery forest by the river does not rise as fast as air more distant to these waters. Further from the river, the vegetation does not have access to such an abundant source of water, and since they transpire less, these plants become much warmer. When the trees in pastures or savannas are felled, sunlight beats almost directly on to the ground and its radiation harms the quality of the soil (e.g., Hernández Daumas, 1999). In gallery forests, tree canopies directly intercept and reflect away much of the radiant energy of the sun. This explains, in great part, the moderating effect of trees on climate (Daley, 2004). The bayamo, a violent wet land wind storm accompanied by lightning blowing outwards to sea that caused sail-ship wrecks, was once much feared1(Chaiwallah 2005; WPIX-TV, 2005); it also causes net loss of water from land. 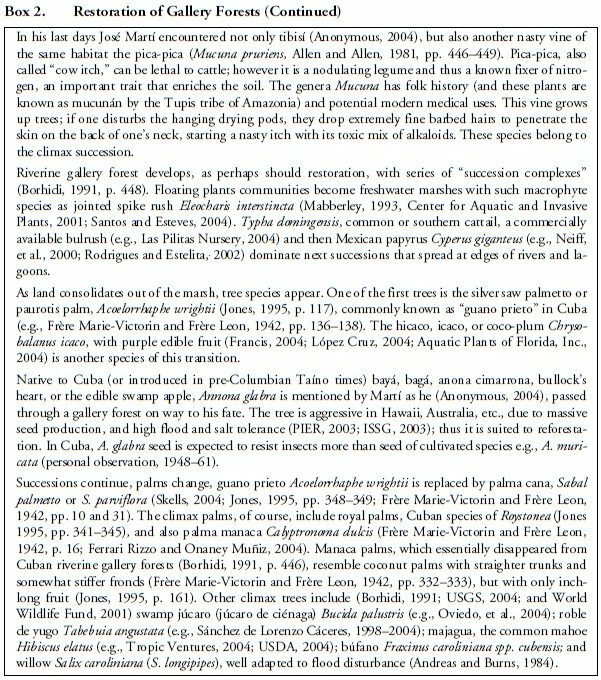 A vivid description of present day desert-like terrain on the Cauto Plain near Holguín and modern day massive rain fall near Bayamo is given by Richard Gregg (2004). Such loss of water was once moderated by dry forest and flood forest with species as in Brazil (Parolin, et. al, 2004) adapted to flood plain ecology. Today, with the dams in place, such a circumstance might be moderated by controlled flooding. Windbreak trees (Daley, 2004) might well increase surface “roughness” and thus retain more atmospheric water vapor (Pitman, 2004); perhaps airborne microbes drifting up from tree microflora (e.g., Akinsoji, 1991) would help nucleate water droplets to aid precipitation of water vapor. Water in higher plants is pumped from the roots to the leaves through a system of conduits called xylem (e.g., Vijayan, 2004). These conduits are replaced on an annual or seasonal basis and become wood. Tree species differ in xylem system structures. These xylem system structures, together with such things as secondary product ducts and differential growth habits, vary in response to environmental conditions. Xylem and associated duct and fiber structures are different in different species of trees. These structural differences results in woods of different density, strength, graining, insect resistance, etc. Once there were many abundant tree species whose trunks provided the numerous and valuable fine woods obtained from Cuban forests (e.g., Fors, 1956). One of these valuable tree species is Lysiloma latisiliqua, commonly known as Cuban Sabicú, and less commonly as Jigüe (Fors, 1956). The area suggested for the remediation is on the northern slopes of the Sierra Maestra, in the former province of Oriente (Granma and adjacent provinces in the new nomenclature). Here the north slope rivers (Box 1), especially the Bayamo and Guamá, flow to the plains of the Cauto. The area of greatest interest is between 20 degrees North and 20 degree 17 minutes North and between 76 degrees 30 minutes West and 76 degrees 45 minutes West. Contour maps of this area and associated rain fall are found at Falling Rain Genomics sites, http:// www.fallingrain.com. Bayamo and the Buey River watersheds were devastated as a result of a long process of forestation in the mountains (e.g., Corrales, 1954). This disaster is often blamed entirely on land owners and logging companies. However, in reality land owners were under pressure to compete with legally protected slash and burn squatters coming in from the plains (e.g., Castro Medel, 2004). Land owners (e.g., grandfather Calixto Enamorado, correspondence, talks with relatives, personal memories) feared losing family property held for centuries if they did not rapidly “develop” forest. In this context, much trouble arose from agitation by communist secret “cells” founded in the Sierra Maestra starting by Rogelio Recio Ramírez in the 1930–1940s (e.g., Corona Jerez, 2002; Anonymous, 2005a) after the very touted but apparently bloodless 1993 rise and collapse of the Mabay Soviet (Mora, 2003). 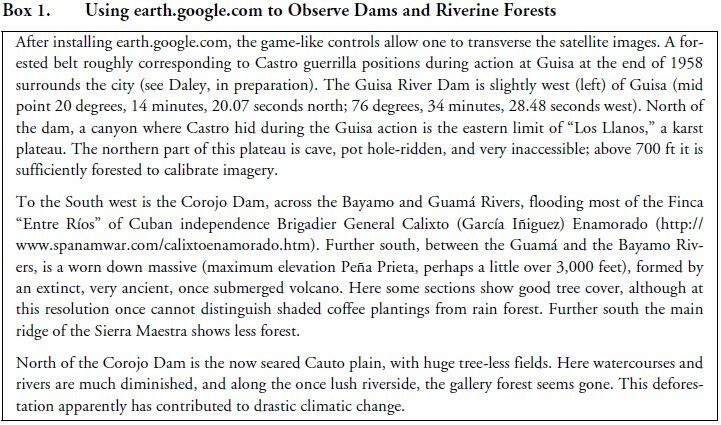 As a result of this deforestation, devastating damage occurred in 1963 during Hurricane Flora (CIA imagery, 1964) and beyond to present day Dennis (Messina and Spreen, 2005), which destroyed Castro’s memorial at La Plata (Cuba Real, 2005), Wilma, etc. Since deforestation continued under almost 48 years of the present regime (e.g., Romero, 1996; Cepero, 2001), the present government must assume a large and increasing proportion of the blame. Such has not stopped supporters of the Cuban government from misquoting even the self-reported Cuban statistics to opposite effect with putative reforestation rates (1.5% per year) that, if factual, would have almost completely recovered the island with forest (e.g., Butler, 1994–2004). The strong solar radiation of the tropics is quite capable, for plant-biophysical and physiological reasons (e.g., Ping et al., 2002), of sustaining several layers of vegetation. In traditional Cuban agriculture, it was common to have pastures and crops under the partial shade of trees. It is not so much that tree roots reach far below those of annual or grasses (Roshetko, 1994), but that shaded under-crop is more water efficient and the soil structure keeps its ability to retain water (Hernández Daumas, 1999). Huge tree-less fields are clearly visible in satellite imagery of rural Cuba (http://earth.google.com, Box 1). These fields show that, despite injection of Cuban government data and close up photograph into international organizations reports (e.g., Renda Sayous, et al., 1997), the great trees that shaded pastures and rural residences until the end of the 1950s are mostly gone. Such “cover changes” in vegetation can have powerful and harmful effects on climate (Steyaert and Pielke, 2002; Pielke and Chase, 2003). Thus it is interesting to note that FAO forestation figures for Cuba (FAO 2001) are, or appear to be, positive, yet these “data” are self-reported and contradict other direct observations (e.g., http://earth.google.com), and even other internal FAO data (compare Cuba’s 17.9% vs. Costa Rica’s 40.3% forest cover). The headwaters of the area of our interest have long suffered deforestation, although there seems to be some, but nowhere near enough, reforestation of pine forest (“Pinus maestrensi”) at highest elevations near the north south divide on La Bayamesa (Fig 26 in Estrada, 1993). Here landslides still occur and the harmful dams that block underground water flow remain (Daley, 2001; http://arth.google.com; INRH, 2002 a,b). Recent rainfall statistics (Alvarez, 1994; Anuario Estadístico de Cuba, 2003), and especially in the eastern part of the former Oriente Province (e.g., Rodriguez et al., 2004) are hard to obtain in raw form. However, one can expect increased total rain fall (Saunders, 1999) and especially the concentrated precipitation of hurricanes (Saunders, et al., 2000; Saunders and Lea, 2005). Thus, one may observe heavy rain fall during a few days, followed by long dry periods. A major factor is the diminished proportion of evapotranspiration that is re-precipitated as rain; in the Amazon this is the major source of rainfall (Souza, 1991), but this factor is now negative in Cuba (Cepero, 2001). Drought promotes fire and loss of plant diversity (e.g., EFE, 2005). Thus, if deforestation is not reversed one can expect acerbated cycles of flood, fire and drought as the increased erosion removes soil and remaining vegetation. 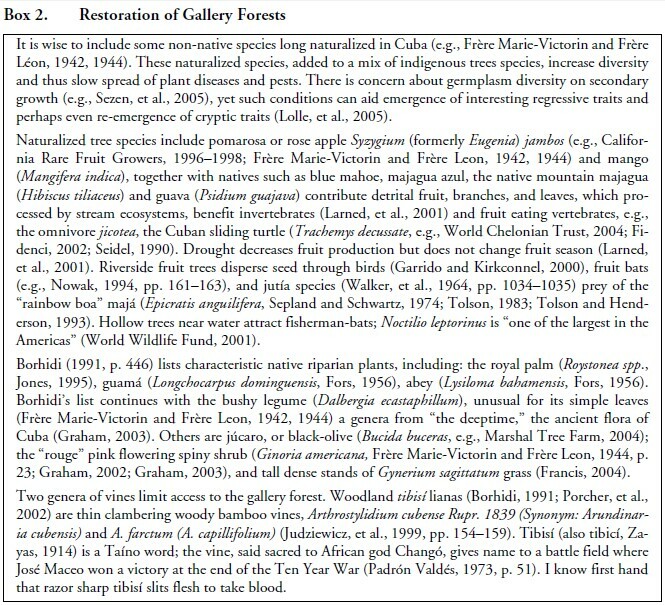 Implementing programs of riverine gallery forest recovery after Castro leaves the scene will be difficult (Box 2). Widespread ecological remediation will require a far different mindset. Thus upper levels of research direction may have to be changed and research funding needed (Daley, 2003). Bird and bat-mediated seed dispersion from remnant trees (e.g., McKey, 2002) and protecting nurse trees (García and Obeso, 2003) may be useful. Motivation to protect the plantings will be needed. To avoid pilferage fire wood for use as cooking fuel, natural gas fuels (perhaps with nitrogen and mercaptan additions to avoid harmful use) must be made available to the population. To spare use of trees as construction timber, one would hope that less expensive steel studs would be available (e.g., San Mateo County, 2005). As the area’s climate is degrading drastically through desertification, native Cuban species may be inappropriate to grow under full brunt of drying winds. Thus, drought-hardy trees adapted to the tropics are needed for windbreaks and nurse trees to shelter plantings of native and naturalized habitat (see Daley, 2004). These nurse trees must be fast growing clonally propagated, sterile, and insect-resistant. Eucalyptus species, an apparently useful solution elsewhere, have not proved satisfactory in Cuba. However, fragmentary research suggests that it is possible to bioengineer a low-chill requiring fast growing, insect resistant sterile hybrid poplar (e.g., Khurana and Singh, 2001; Chen, et al., 2000; Tian Ying-Chuan, et al., 2000; Sen-Sarma, 1992). Since, this will take a number of years and will be useful in other countries it is suggested that that such a project be funded in the U.S. immediately. Much of tourism is based on legend, mythology, or oral tradition, such as the Arthurian legend in England and Wales. Thus the wide spread legend of the Jigüe, Güije, Wijili, Jakuí cannot but help future tourism, as does the harmless reality, but terrorizing superstitions that surround the nocturnal calls of the whippoorwill-like Cuban “goatsuckers,” e.g., Caprimulgus cubanensis (Garrido, 1983; Garrido and Kirkconnel, 2000) and the erratic night flights of fruit eating, tree seed dispersing, bats that were once though hupía night ghosts. Fossil ground-sloths are commonly found in Cuba (Matthew, 1919; Hedges, 1996; Turvey, 2005); one wonders if some were stabbing ground sloths (Farina and Blanco, 1999). Perhaps these ground sloths had such stabbing teeth merely to eat mollusks. There were gigantic running owls (e.g., Silva Lee, Alfonso 1996) and the long extinct Cuban condor (Suarez and Emslie, 2003). What prey or carrion this condor ate is not yet explained. Late extinction of such large fauna—the ground sloth is reputed to have died out as late as 1550 in the largest Antilles, but earlier in Puerto Rico—suggests human or perhaps even humans of Luzia type (putative Jigüe) intervention. The ground sloth may be the first animal of the lost mega-fauna restored through DNA technologies. And without lumping them with fauna, the Taínos still have a cultural presence. All this adds not only to general knowledge but also serves to inform the more serious tourist. Water-vegetation interactions explain ancient Jigüe myths once thought manifest by the chill of evaporation near forested riverbanks. These relationships between vegetation and water are important to the Cuban climate moderation, ecology, history and economics. Suggestions to restore gallery forests in Cuba especially in the Cauto Basin, after Castro is gone are presented. The Jigüe myth and related matters of Cuban pre-history are potential major tourist attractions during post Castro economic, ecological and climatic restoration. 1. Bayamo, named for the Bight of Bayamo in Cuba, was a simultaneous blast of wind and lightning, frequently lethal to sailing ships. For example, the following limerick: “When we’d hardly hove into the bay,/ A bayamo took both masts away. / We had hoped to make sail / And run home ’fore the gale. / But now we’re in Cuba to stay. (Chaiwallah, 2005).